Located conveniently in the heart of Baton Rouge, The RV Shop is one of Louisiana's top Recreational Vehicle dealerships. The RV Shop proudly serves customers all over southern Louisiana, including Lafayette, New Orleans, Lake Charles, Gonzales, and Hammond. Regardless of what kind of RV you are in the market for, you will be able to find something that checks off every box on your list within the new inventory at The RV Shop in Baton Rouge! 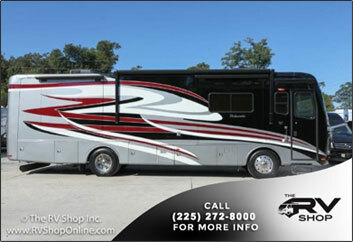 The RV Shop carries recreational vehicles of all shapes and sizes, and from a variety of known and trusted brands. 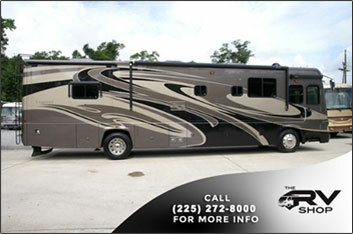 If you are looking for a pre-owned RV anywhere in Louisiana, you have come to the right place! The The RV Shop has a wide variety of top-of-the-line pre-owned RVs and motorhomes that are ready to be taken on an adventure! You may find models from as early and recent models with very low mileage. You can browse The RV Shop's pre-owned inventory from the comfort of your own home online through our easy to navigate website. All vehicles require regular maintenance over the years in order to run smoothly, and RVs are no exception. The RV Shop near Gonzales, LA, has a service department that will keep your RV running in like-new condition for years to come. The Service Department at The RV Shop has the resources to perform the manufacturers recommended services that your RV may require. We are a qualified repair facility that can handle any necessary repair or maintenance work for your RV. Our goal at The RV Shop is to provide the best possible customer service and satisfaction! "This place has had everything I've ever look for and older pull-behind camper, also if not in stock they can order quickly, also very nice staff." If you still cannot find what you are looking for in our inventory, simply give us a call and we will find it for you. The RV Shop is happy to assist you in any way we can!